A 21 year old primigravida at 36 weeks and 2 days of gestation presented to emergency with severe intractable headache. She was evaluated to rule out all pathological causes of headache as she was not responding to basic conservative measures like relaxation therapy, paracetamol, hydration for benign headaches. Neurophysician finally diagnosed her to have developed new onset migraine after noting the imaging studies to be normal. Here we discuss the spectrum of causes of headache in pregnancy, which can just be a innocuous symptom to a warning sign of a serious underlying pathology. Headache is amongst one of the most common discomforts in pregnancy. It can occur at any time during pregnancy; more commonly during first and third trimester. Commonest causes in first trimester include deprivation of sleep, dehydration, hypoglycemia, and stress. However most of the times headache will be secondary to an underlying pathology like pre eclampsia, TB meningitis, or reversible cerebral vasoconstriction syndrome (RCVS). 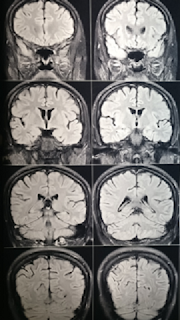 A 21 year old primigravida with 36 weeks and 2 days of gestation was referred to our tertiary hospital with severe and intractable headache for evaluation. Headache was sudden in onset, in frontal and temporal region, throbbing in nature, non radiating, not associated with any pre monitory symptoms of preeclampsia, seizure episode, injury to head, loss of consciousness weakness of limbs, slurring of speech, bowel and bladder disturbances, fever, neck rigidity, and/ or photo phobia. She had 5 to 6 episodes of vomiting. On examination, her blood pressure was 120/80 mm Hg, urine albumin was absent, and knee jerks were normal. On abdominal examination uterus was 36 weeks in size and fetus was in the longitudinal lie with vertex presentation. Neurological examination showed no neurological deficits & cranial nerve examination was normal. She was initially admitted in medical intensive care unit for evaluation of headache. Fundoscopy was done and papilledema was ruled out. As patient gave history of vomiting, she was given prophylactic antibiotics as empirical treatment of meningitis and parenteral mannitol. Lumbar puncture and electrocardiogram were not done. Ophthalmologists excluded refractive errors as a cause of headache. Urgent neurology reference was sought. They advised magnetic resonance imaging (MRI) of the brain without contrast and venography to rule out cortical venous thrombosis. It revealed no abnormality. Symptomatic treatment was given for headache and vomiting in the form of paracetamol and ondensetron. Hydration was given with normal saline infusion. In spite of the treatment patient had no improvement in headache. 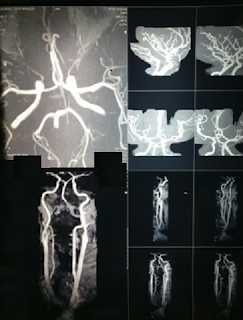 Senior nuerophysician advised MR angiogram to rule out reversible cerebral vasoconstriction syndrome (RCVS) (Figure 1) Neurophysicians diagnosed her as a case of new onset migraine. As the headache was not relieved, decision to induce the patient was taken as the therapeutic agents that were advised were relatively unsafe in pregnant women like selective serotonin reuptake inhibitors, beta blockers, ergometrine derivatives. However she went into spontaneous onset of labor. She delivered a healthy male child weighing 2.8 kg. There was significant improvement in headache postpartum and did not require any medication for her headache. She was discharged on 4th postpartum day with prescription of NSAID if headache recurred and to follow up with neurology. Figure 3. MR venogram showing normal cortical and sagittal sinus. Headache is encountered commonly in pregnancy and can range from primary headaches, which are benign in nature to headache secondary to serious underlying pathology. Headaches in pregnancy are classified into benign and pathological, benign type including migraine, tension type headache, cluster headaches, analgesic-overuse headaches, and others. Pathological headaches can be due to a vascular event (hemorrhage or thrombosis) or raised intracranial pressure (ICP) such as in brain tumors and normal pressure hydrocephalus. Headache marks the most common red flag sign of preeclampsia which requires active intervention. It is occipital, continuous, dull aching pain. Preeclampsia is linked to increased vascular reactivity, increased vasoconstrictors, endothelial damage and platelet hyperaggregation. Migraine is a common type of headache characterized by its unilaterality and pulsatility. The incidence of migraine is highest during the reproductive years in women. Headaches in migraine are following the stimulation of trigeminal sensory neurons and the perivascular nerve endings, which is due to vasodilatation of extracranial and meningeal blood vessels. Migraine headache is influenced by estrogens. Increase in estrogen relieves the symptoms and decreased levels worsen the symptoms. As many as 10% of headaches initially present or are detected for the first time during pregnancy.Migraine during pregnancy is difficult to diagnose as it needs to be differentiated from pre-eclampsia and other grave disorders like vascular disease, stroke, pseudotumor cerebri, hemorrhage, tumors, and infection. Reversible Cerebral Vasoconstriction Syndrome (RCVS) encompasses a diverse group of conditions, including hypertensive encephalopathy, and vasculopathies associated with pregnancy and postpartum (postpartum angiopathy). RCVS is characterized by sudden onset of a severe (thunderclap) headache. Interestingly, approximately 15% of patients with RCVS have a history of migraine headaches. Key examinations used to evaluate headache in pregnancy includes recording blood pressure, and urinalysis for proteinuria. Fundoscopy to see for signs of raised intracranial pressure should be done. Plantar responses, cranial nerves, gait assessment, tone, power, reflexes and coordination of all four limbs should be assessed. Neuroimaging might be considered in the evaluation of women with headaches that are of new onset or different from their usual headaches. In most patients with established migraine, however, neuroimaging is not usually necessary. Evidence-based guidelines issued by the American Academy of Neurology suggest that neuroimaging should be considered in the following patients with non acute headache: patients with an unexplained abnormal finding on neurological examination; patients with atypical headache features or headaches that do not fit in the strict definition of migraine or other primary headache disorders (or who have an additional risk factor, such as immune deficiency); and patients with sudden severe headache. 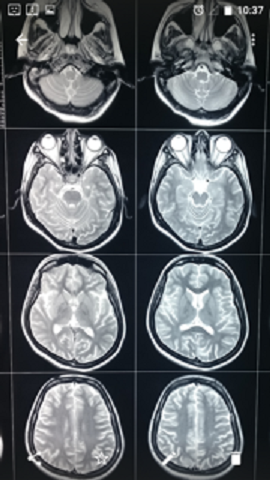 As single exposure to CT scan is within the limit of acceptable radiation (0.05Gy), a head CT scan is sufficient when neuroimaging is considered necessary. MRI is considered when a posterior fossa lesion or cerebrospinal fluid leak is suspected. MR angiography and MR venography are indicated when an arterial or venous lesion (for example, cerebral venous thrombosis) is considered in the differential diagnosis. Non-pharmacological treatments, including biofeedback-assisted relaxation, hydration, bed rest, and a reduction in work or home responsibilities are usually enough to manage primary benign headache during pregnancy. Biofeedback methods combined with the occasional use of over-the-counter analgesics (for example, acetaminophen) are sufficient to control mild headaches in pregnancy and are safe to use during pregnancy. Additional pharmacological methods are required in approximately 25% of women for management of intractable headache during pregnancy. β-blockers, calcium channel blockers, and selective serotonin reuptake inhibitors (SSRIs) are the additional therapeutic drugs available for treatment of migraine. Daily migraine prophylactic dose should be considered in women who have at least three or four severe migraine attacks per month throughout pregnancy. Use of the β-blocker propranolol increases risk of intrauterine growth restriction during pregnancy. Metoprolol and labetalol are alternatives to propranolol during pregnancy; however, with all of these agents, close ultrasound monitoring of fetal growth is essential, particularly throughout the third trimester. Calcium channel blockers are effective for the management of migraines as well as to treat hypertensive disorders during pregnancy. Short-acting forms of these drugs can, however, lead to a sudden drop in maternal blood pressure and decreased uteroplacental perfusion, especially among hypertensive patients. The SSRIs, especially paroxetine, have been associated with an increased risk of congenital heart defects, neonatal pulmonary hypertension and autism. However, they have to be used with caution as most of the literature concerning the association between SSRIs and congenital anomalies is inconsistent. Though our patient was diagnosed with migraine, the fact that she was better immediately postpartum without any therapy goes against the diagnosis. It is important to note that pregnant woman with a simple symptom of headache can be at a high risk of myocardial infarction. Most headaches in pregnancy are benign and are due to primary headache disorders and can be treated with only reassurance and without any pharmacologic agents. A high index of suspicion for serious underlying pathology is necessary if atypical features are identified on history and/or clinical examination especially if a woman presents with a headache for the first time in her pregnancy so as to prevent significant morbidity and mortality. Headache Classification Subcommittee of the International Headache Society (IHS) The International Classification of Headache Disorders, 3nd edition,(ICHD-IIRI). Cephalalgia 2013;33(9):629–808. http://www.ihs-headache.org/ichd-guidelines. Cunningham FG. Neurological disorders. In: Cunningham FG, Leveno KJ, Bloom SL, Spong CY, Dashe JS, Hoffman BL, et al. editors. 24 th ed. Williams Obstetrics. New York: McGraw-Hill Education; 2014. p. 1187-89. Melhado EM, Maciel JA Jr, Guerreiro CA ;Headache during gestation: evaluation of 1101 women. Can J Neurol Sci 2007;34(2): 187-192. Calabrese LH, Dodick DW, Schwedt TJ, Singhal AB. Narrative review: reversible cerebral vasoconstriction syndromes.Ann Intern Med. 2007;146(1):34-44. Frishberg BM, Rosenberg JH, Matchar DB, McCrory DC, Pietrzak MP, Rozen TD, et al.,Evidence-Based Guidelines in the Primary Care Setting: Neuroimaging in Patients with Nonacute Headache. The U.S. Headache Consortium.2005;3-18. http://tools.aan.com/professionals/practice/pdfs/gl0088.pdf. Boukhris T., Sheehy O., Mottron L, Bérard A. Antidepressant Use During Pregnancy and the Risk of Autism Spectrum Disorder in Children. JAMA Pediatr. 2016;170(2):117-24. Wabnitz A, Bushnell C.Migraine, cardiovascular disease, and stroke during pregnancy: systematic review of the literature. Cephalalgia. 2015;35(2):132-9.